The Chauncy Hall Building on Boylston Street at Copley Square in Boston, on October 4, 1912. Image courtesy of the City of Boston Archives. This building, located at 585-591 Boylston Street across from Copley Square, was probably built within a year or two of the first photo; the MACRIS online database estimates that it was built in 1916, but clearly this is off by a few years if the first photo was taken in 1912. The first scene shows a wide variety of uses for office space in the building. Signs in the upper floor windows include two women’s rights organizations: the Massachusetts Woman Suffrage Association, and the less concisely-named Boston Equal Suffrage Association for Good Government (women would get the right to vote nationwide eight years later). The top floor apparently housed the Loyal Protective Insurance Company, and a barber shop occupied the far right suite on the second floor. 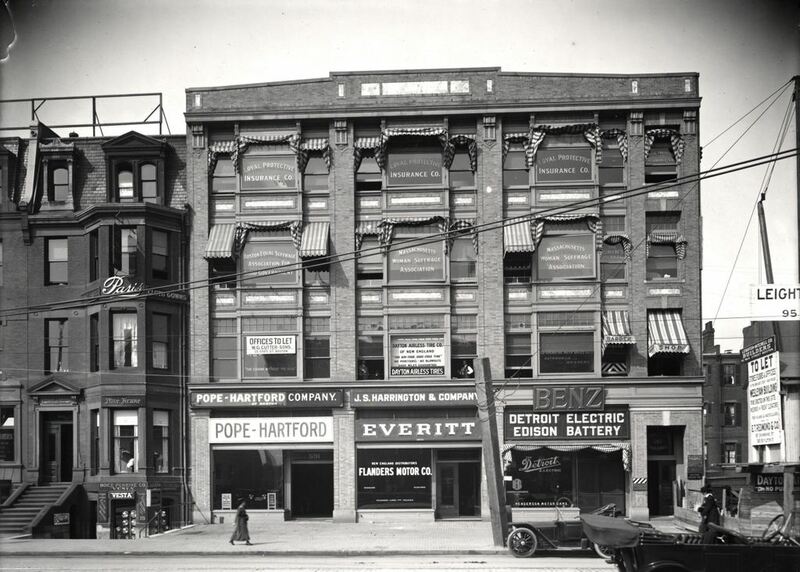 The rest of the building was apparently dedicated to automobiles and automobile parts; signs advertise for the Detroit Electric Edison Battery and Dayton Airless Tires, along with manufacturers ranging from well-known modern brands such as Benz, to long-forgotten ones like the Flanders Motor Company. Flanders, which occupied the middle storefront, wasn’t in business for much longer than the time it took to take the photo, but according to the lettering on the windows they had both gasoline and electric cars. At the time, electric cars were just falling out of fashion, and would not reappear again for another century or so. Today, the Victorian rowhouse to the left is gone, but the Chauncy Hall Building is still standing. 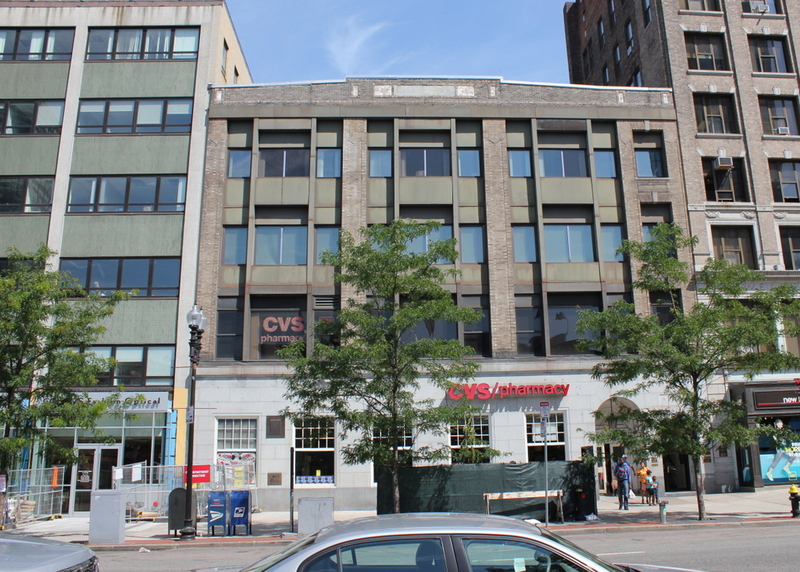 The ground floor has since been heavily altered, and now houses a CVS, but the exterior of the upper floors is still essentially the same from 1912. One interesting item of note from the first photo, however, is the large “To Let” sign on the extreme right. The sign advertised for rental space for “stores, floors & offices in the new eight story fireproof Wesleyan Building to be erected on this site.” The building appears to have been under construction in the 1912 photo, and is still there today to the right of the Chauncy Hall Building.